You are here: Home » Contributors » What is Your Project For? The finished product – a unique award winner that I love to drive! This week as I was thinking about a subject for the blog, my mind kept focusing on my GMC truck. So, I thought it might be interesting to discuss the truck both as THE PROJECT and what I really wanted out of it. 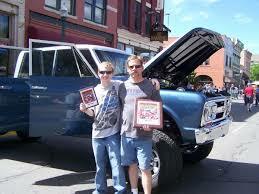 To start with, in 1999 my wife Lori and I went on a portion of the Hot Rod Power Tour (back when they came out West). We had a blast because on the Power Tour you get the chance to run down the highway with a bunch of other idiots, all who are driving some version of their dream car that may or may not be completely ready for a trip to the local parts store, let alone highway speeds and long distances. Such is the way a great adventure starts. When we came home I had decided that the only way the experience could get better was to include my whole family. My wife and I have three children so I decided that we would need a big truck with plenty of room for people and gear, and maybe an entertainment system for the kids. A Suburban is what came to mind; dropped into the weeds, late 60’s, maybe a 68’ since that was the year I was born, a nice big block under the hood; plush! I found a 1972 Chevy Suburban within a couple of weeks of starting my search. It was rough and not entirely complete (like mostly missing) but the $200 price was right and I decided it wasn’t a problem because I wanted to customize everything anyway. As soon as I got the truck home I began a complete frame off build and ran into my first problem; I discovered that Suburban’s are UGLY and now that I had one I was seeing them everywhere I looked. That led me to my first solution for the build; I needed not a Suburban but instead a Crew Cab pickup which stills seats 5 and has plenty of storage. Unfortunately GM never made a CrewCab in the 67-72 body style,* but I assumed that would not be an issue as I’d just make my own. This led me to the discovery of my second problem; I don’t like the Chevy front clip and I only really like the 1967 GMC Hood and fenders. After a long phone call to LMC Trucks (and a lot of sheet metal later) I had all of my patch panels for the rough areas and a created a new front clip suitable for my taste buds. I then took the big plunge and cut the Suburban in half. Following that I found a ’67 pickup cab (with the small window) to take the rear panel from, and with the magic of a tape measure, a welder, and lots of grinding pads I created a CrewCab. With the bulk of the work done (or so I thought) I then discovered that I had yet another problem; 2 wheel drive trucks are everywhere! This one was a fairly easy solution, at least in theory, as I decided the easiest solution was to create a lifted 4×4. This would require a custom frame and body/bed mounts (and you can almost hear the money falling out of my pockets). Before long I had a bunch of parts that were starting to resemble a truck and, although I had come a long way, the end was not yet in sight. I had originally dreamed of a nice big block for motivation, but after looking into it I didn’t like the cost of it all. Perhaps my budget is more apt to a small block, but since I hate tinkering with carburetors it just had to be one with fuel injection. This is when I came across a nearly new 6.0L LS engine and 4L80e transmission from a wrecked Chevy truck that had 3 miles on it. (It had been damaged during shipping to the dealership!) It took me some time to wire everything up the way I wanted it, but this was probably my best decision because this engine & transmission have worked without trouble since I started them the first time. (You can hear a sound bite on the gallery page for the truck). Now I just needed a little paint (three gallons worth), some interior, and I was on the road. Best Laid Plans. Now everyone knows that I have skipped hundreds of steps and thousands of dollars just for the sake of making this readable, but I think that you get the idea. I figured out that if I had started with a plan things probably would have gone much smoother, cheaper (which is a VERY relative term) and quicker. Doing things as I did gave me a great truck AFTER 12 YEARS and a budget that would have bought my first house TWICE. Honestly, I’m not sure that that I really could have done it much cheaper, but it would have been done far sooner. I LOVE my truck; it sits on 35” tires, is very drivable, has won awards, always gets a crowd to gather when I drive it, and is just plain COOL. Unfortunately though, guess what we still haven’t done with it? Another Power Tour…. and now my oldest lives 500+ miles away, the middle kid just started college ,and the youngest is a junior in high school. It depends how you look at it. The idea of taking my entire family with me on the Power Tour didn’t happen, but I did end up with a truck that I am proud to own and that, at different times, my family and I have taken for a drive to town, and most importantly, a truck my sons helped me build! So, I’d say Mission Accomplished! * Yes I know, GM did actually make some crew cab trucks for the railroad, but there were not many and they were not available to the general public. Also, they used front doors for all 4 which is too ugly for me!